After graduating, Paul got married, started going back to church, and even began tithing. All the boxes were checked. At the time, Paul was carrying the bag for Vijay Singh, one of the best golfers in the world. His professional caddie career was at an all time high. But his personal life was deteriorating. In 2004 Paul divorced, and after several years of broken relationships and broken promises to others and himself, he knew something had to give. In 2010, after coming to the realization that something in his life had to change, Paul decided to get baptized. Five months later he was fired from his job for the first time in his life. At the same time, the real estate market crashed and Paul lost everything he had earned from his golf career. He was dating his now wife, but they broke off their engagement at the time due to the stress of the crushing realities around them. One week later, Paul was faced with a major career decision. He had job offers from two golfers, both ranked in the top 10 in the world. Paul explained being uneasy with the decision, having a hard time settling with one or the other. Then 30 minutes before he was going to make a call to accept the job offer, the phone rang and pro golfer Webb Simpson was on the other end. 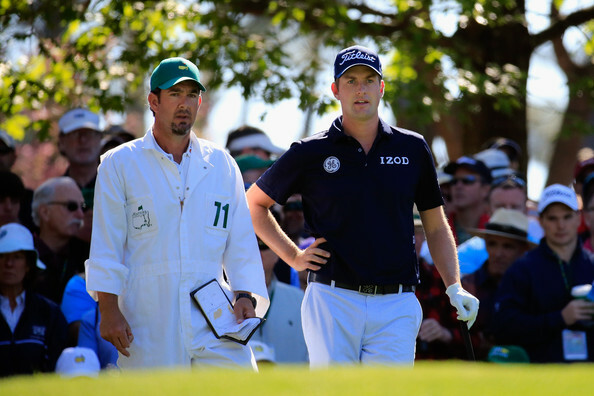 On the courses, Webb Simpson has a strong reputation as a Christian. People describe him as a believer first, a golfer second. Paul explained, “People always wanted to be paired with Webb because he was kind, easy to work with.” He had character. After getting back on track with Paul and coming to peace with the situation, as Webb stood on the 71st hole tied for the lead he turned back and said to Paul, “If we win, this will all go away, but we’ll have eternity forever.” Webb would win the U.S. Open that year. Isaiah Tesori at The Masters 2018. Whether at home or on the road, Paul is always digging into the Bible. Thirty years ago, PGA Tour Chaplain Larry Moody started a Tour Bible Study that has stayed intact. During golf tournaments all over the country, the College Golf Fellowship helps coordinate bible studies one night a week so players have an opportunity to study together with familiar and new faces. Their traveling mentors will go wherever the players are, making sure the groups are available. Bubba Watson, Webb Simpson, and Paul make sure not to miss them. “Try to look into the mirror first. Ask yourself, am I personally gossiping at work? Can you stop the gossip or not take part in it, walk away? Watch your language. Are you using profanity, sexual undertones? Also, are you encouraging your coworkers? Are you jealous or envious of them? Or are you celebrating them? For Paul, work has become all about a means to give. And one of the major ways he and his family work to love their neighbors and impact their community is through the Tesori Family Foundation. In January 2014, Paul and his wife, Michelle, welcomed their son Isaiah into the world. After a very traumatic first few hours and several tests later, it was determined Isaiah had Down Syndrome. The intense love for their son combined with the treatment they received at a local hospital while Isaiah was in the intensive care unit lit a fire in the Tesori Family Foundation. Founded in 2009, the couple used the foundation as a way to give back to the less fortunate in different ways. But it wasn’t until Isaiah was born that the work of the foundation found it’s purpose and passion. Today, the work flourishes through six full programs helping kids with special needs and they families.